There is a general fear in the retail industry regarding online shopping and consumer spending habits. It is true that online sales are growing at a rate of 10% annually, but according to Forrester Research and the National Retail Federation, brick-and-mortar stores are still growing at a rate of 4%. A Mall Shopper Behavior Study performed by EyeShop found that nearly 3 in 10 shoppers are visiting malls more often today than 2 years ago. In particular, 40% of 18 to 44 year olds (one of the most important age groups for retail) are spending more time at the mall. Shoppers are spending an average of 2 hours and 42 minutes on each trip and visit 6.1 stores. Retail centers are still making upwards of $2,000 per square foot according to Fortune magazine so clearly people are still drawn to a more tangible shopping experience. Although consumers primarily visit retail centers to shop, they now often look to do more during their visit. Successful malls and retail centers are adding attractions like skating rinks, movie theaters, interactive fountains, museums and even small amusement parks to draw people in. And more attractions necessitate more space, which is actually a good thing. According to a 2006 study done by the National University of Singapore, larger shopping centers do a better job of keeping shoppers in the area. Consumers spent an average of 2 hours at large malls and retail centers, compared to 1.4 hours at smaller venues. The size of the mall fully impacts the experience, including stores and services and how much time and money is spent. Therefore, retail centers are now considering maintaining an environment that feels all-inclusive, so they keep customers on-location longer. 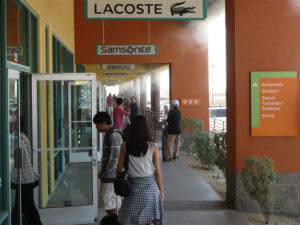 The largest malls and outlet centers are primarily outdoors, with large walking areas and semi-sheltered walkways. Customers enjoy the experience of shopping al fresco, as it can remove the unpleasant associations many have with malls including bland interior design and poor lighting. However, during the hot summer months, these walkways and outdoor resting areas can become unbearable and turn potential customers away. Keeping areas cool with standard AC systems is not always feasible, nor efficient, and certainly not cost-effective for outdoor spaces. But a high-pressure misting system is a solution that delivers outdoor cooling tailored perfectly for small and large retail environments.